It’s Valentines Day, you know. I sure hope you have a little (or big) someone you like to kiss and hug. Because hugging and kissing is pretty nice to do on Valentines Day, don’t you think? A long kiss on the lips of your sweetheart, a gentle kiss on the forehead of your scraggly haired 5 year old, a sweet kiss on the cheek for dear old mom, or how about a nice big bear hug for your teenage daughter or son. All good. All great in fact. And if not…don’t sweat it. Tomorrow the day of love will have passed and there will be a lot of cheap Valentines Day candy on clearance at Walmart. Happy days are here again, right? 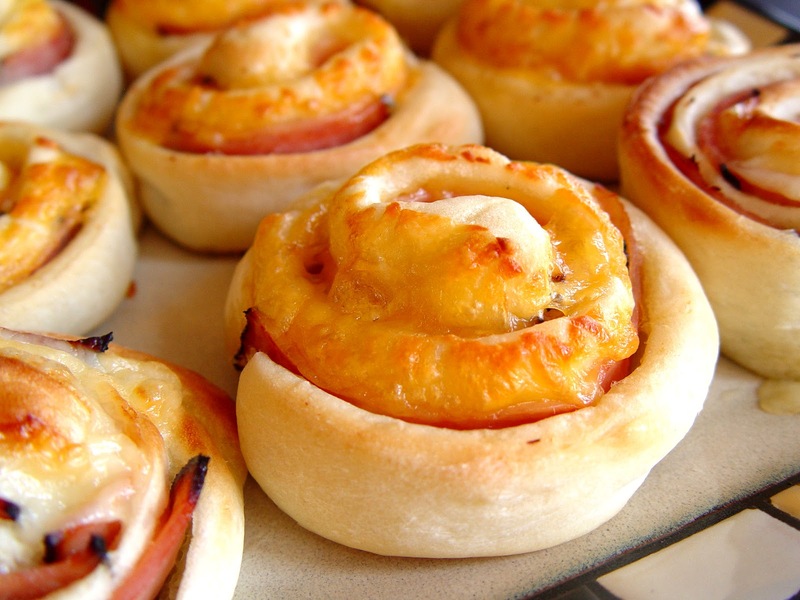 These Hot Ham and Cheese Pinwheels are absolutely scrumptious, come together in less than and hour and will put a lovely smile on the face of all the folks you love. They are wonderful served warm from the oven. They are also pretty great cold from the fridge. I tucked them into my kids’ lunches for a few days last week. They seemed to think that was pretty cool. Let’s make them, shall we? and 1 tablespoon yeast. Turn the mixer on low for about 30 seconds allowing the ingredients to combine. Let it rest for 5 minutes, or until it gets all bubbly. and 2 cups flour. Turn the mixer on to low and let the flour mix in. Add the rest of the flour (2 1/2 cups worth) one cup at a time. When the dough pulls itself away from the side of the bowl, you have enough flour. 4. Turn the mixer to medium speed and allow it to mix for 5 minutes. 5. Spray your counter with cooking spray, divide the dough into two equal parts and allow them to rest on the counter for 5 minutes. Don’t skip this step, ok? If you don’t let the dough rest it won’t roll out nicely and then you might start to cry and then your kids would think you have lost you mind. Thanks for your cooperation. 6. After the dough has rested roll the old girl out into a large rectangle. and sprinkle it with 1 cup of cheddar cheese. 8. Roll the dough up starting at the longer end. 9. Spray a large knife with cooking spray and slice the roll into 12 rounds. 10. Place each pinwheel onto a large cookie sheet that has been sprayed with cooking spray. 11. Repeat steps 6-10 with the other half of the dough. 12. Place both pans into your warm 170 degree oven for about 10 minutes, or until they start to rise just a bit. You don’t want them to get super puffy, you just want the dough to have the chance to expand a little, like you see in the picture above. 13. Turn the oven up to 350 degrees (don’t take the pans out of the oven) and let the pinwheels bake for about 15 minutes or until golden brown along the top and bottom. 14. 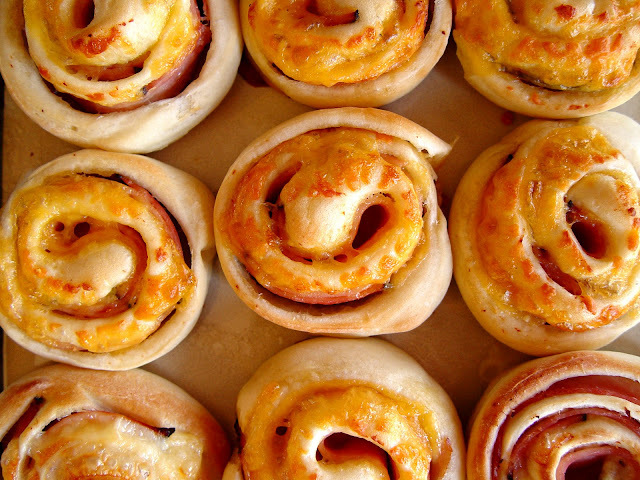 Take the pans out of the oven and let the pinwheels rest for about 5 minutes…then gobble them up. This recipe is amazing! 🙂 Thank you! Spread some mustard on the rolled out dough before the cheese and ham, they’ll taste even more amazing! Could I make the dough the night before and put it in the fridge until the next evening? I am going to a friends house to do the cooking but will not have time to make the dough there. It would be best to make them from start to finish, once they have cooled cover them with plastic wrap and store in the fridge. When you are ready to serve remove the plastic wrap and heat them in a 350 degree oven for about 10 minutes. Best of luck to you! Hi there to every body, it’s my first go to see of this webpage; this webpage carries amazing and truly excellent data in favor of readers. Love this recipe! I’m a busy college student and its something I would like to make to keep in the freezer for last minute lunches/dinners. Are they best to roll them and slice them and then freeze, or bake first and then put in the freezer? Also, if they come right out of the freezer, what temperature would you suggest baking them at and for how long? I would bake them, then after they cool you can put them in a freezer safe ziploc bag and pop them in the freexer. Put them in a 350 degree oven for about 10 minutes to reheat. Best of luck to you! Excellent weblog right here! Additionally your website so much up very fast! Hi wanted to know can you use dough that’s already made n just roll out. I’m making this for school. Do you think I could make it the night before or that morning and give them out around 1:00 pm? I don’t know if I should freeze it and leave it freezed and serve it like that or freeze it the night before and bake it in the morning. Thanks for your question. This recipe will freeze well, but you will need to make them from start to finish (including baking them), then let them cool completely before you freeze them. Once you are ready to serve, let them thaw on the counter for about an hour then reheat in a 350 degree oven for about 10 minutes. These were a great starting off point for me! I decided to amp it up a bit and I melted a few cloves of garlic with some butter on the stove getting the garlic nice and toasty and then painted that on the dough before adding chives and half a large scallion that had been diced to the mix! I would have also knocked a good sprinkling of garlic powder over these if I had any. I also brushed the tops of each of them with the garlic butter. My fiancé ate 7 in one sitting which while not very good for him, at least I know that none are going to waste! I didn’t divide my dough as well as I probably should have (I used a scale and everything and yet still…) as one roll ended up much thicker than the other! Super delicious, thanks for the recipe! Oops, not half a large scallion half a large shallot!